Liling's Blog: The Maze Runner movie review. The Maze Runner movie review. Kemarin keluar lagi. Hahaha.. tengok The maze runner pula. Sixteen-year old Thomas (Dylan O'Brien) wakes up inside a rusty elevator called The Box. When he arrives at the top, he is greeted by other boys in a grassy clearing called the Glade, which is surrounded by tall, gray walls. Thomas is unable to remember anything about himself, but Alby (Aml Ameen), the leader of the Glade, tells him that it's happened to everyone and that his name will come to him soon. He shows him the Glade and how it is entirely run by the Gladers, as they call themselves. Thomas wonders what is beyond the opening in the wall adjacent to the Glade, but he is warned not to go through there, as it is a maze. Thomas meets Chuck (Blake Cooper), and the two become friends. There is a party that night to welcome Thomas, the newest arrival. Every month The Box sends up a new person, along with supplies. Newt (Thomas Brodie-Sangster), second in command and gardener, explains that the most able Gladers become Runners, who are the only ones allowed into the Maze. They search for an escape route during the day, but return before nightfall, as the Maze entrance closes at dusk, and no one has ever survived a night in the Maze. Thomas ends up in a fight with a boy named Gally (Will Poulter), during which he suddenly remembers his name. While Thomas is gathering supplies in the woods, he is viciously attacked by Ben (Chris Sheffield), a Runner, who has been stung by a Griever - deadly monsters that lurk the maze. The Gladers force Ben into the Maze to die. 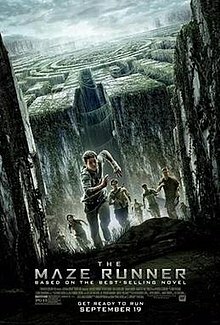 Minho (Ki Hong Lee), a runner, and Alby attempt to retrace Ben's steps in the maze, but Alby is stung and rendered unconscious. Minho appears at dusk, dragging Alby, but is unable to reach the entrance in time. Seeing this, Thomas runs into the maze. Minho and Thomas survive the night, with Thomas successfully killing a Griever, and they return the next day with Alby to the astonishment of the other Gladers. Gally, upset that the fragile peace between the Gladers and the Grievers may be in jeopardy, proposes punishing Thomas for entering the maze, though Newt overrules him and makes Thomas a Runner. Thomas accompanies Minho and a few others into the maze. They find the Griever's corpse and remove a beeping mechanical part, discovering that it is numbered to correspond to a certain section in the maze. The Box sends up the first ever girl, who apparently recognizes Thomas. A note in her hand says she'll be "the last one ever". The girl, named Teresa (Kaya Scodelario), carries two syringes filled with a mysterious substance. The Gladers use one on Alby, and he gradually recovers from his sting, as well as his memories. Minho and Thomas venture into the section of the maze on the Griever's part, discovering an escape route. They barely make it back after being forced to escape, and inform the others. That night, a wave of Grievers pour in from the walls and attack the Gladers, killing a cured Alby, among many others. Thomas stabs himself in the leg with a severed sting and remembers that he and Teresa were part of the organization that created the maze, and that all of this was a test. Gally blames Thomas and Teresa for everything and attempts to execute them. The Gladers stop him, and most of them follow Thomas through the maze's escape route. They end up in a lab with the dead bodies of scientists strewn everywhere. A video recording of a woman plays, explaining that the planet has been destroyed by increased solar activity, followed by an epidemic. The youths in the Glade were all part of an experiment researching their apparent resistance to the epidemic. At the end of the recording, she shoots herself in the head as the lab is attacked. Gally then appears, delirious from being stung. He fires a gun at Thomas, but Minho stabs and kills him. Chuck is killed by Gally's shot. Masked men rush in to take the group away to safety, and the maze is revealed to be in a vast desert. The dead scientists appear alive, stating that the experiment has been a success, and the survivors are now entering Phase Two.